Summary: Boy has lived his life on a French manor that has recently been ravished by pestilence and other misfortune. As a hunchback, he is frequently the object of bullying and ridicule. When a stranger named Secundus appears and tells Boy he is on a pilgrimage to collect relics of St. Peter, Boy is intrigued. He thinks if he can get to Rome, he can ask St. Peter to remove the hump on his back and turn him into a regular boy. As the two travel together, meeting up with all kinds of adventure, it becomes clear that Boy is not a regular boy and never will be one. He has a secret that he slowly begins to share, and by the end of their journey, both Secundus and Boy have been transformed. Boy ends up back home on the manor, but it is clear life will never be the same for him again. 288 pages; grades 4-7. Pros: An intriguing story that may appeal to fans of The Inquisitor’s Tale, which also takes place in France about a century earlier (1242 vs. 1350). 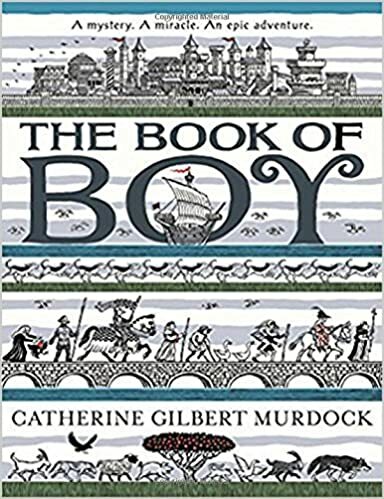 Boy is a kind and gently funny narrator, and Secundus is a fascinating character of mysterious origins who is transformed by traveling with Boy. Beautiful woodcut illustrations appear at the beginning of each chapter. A possible Newbery contender. Cons: These medieval French tales can be a hard sell for most elementary school crowds, and if I had to choose one to recommend, I would go with The Inquisitor’s Tale.